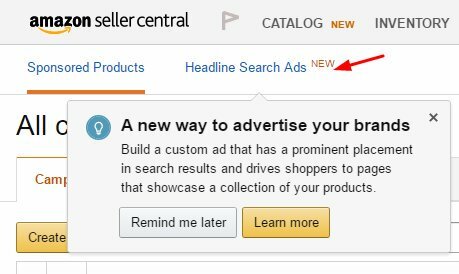 If you happen to sell products on Amazon’s Seller Central, you may have noticed a link for Headline Search Ads under Advertising. While not yet available to all sellers, Amazon does seem to be rolling this feature out to select sellers. Amazon may have an abundance of opportunities for sellers to advertise their products, but what tools are available depends on whether you have a Seller Central or Vendor Central account. Sellers who have a Vendor Central or Vendor Express account, have access to Amazon Marketing Services (AMS). AMS has three primary advertising solutions to help drive sales including Sponsored Product Ads, Headline Search Ads, and Product Display Ads. Until recently, Seller Central accounts only had access to Sponsored Product Ads. For Seller Central account users who have registered their brand, having access to Headline Search Ads give them another opportunity to advertise with keyword-targeted ads that leverage custom headlines. Headline Search Ads appear at the top of search results. Your ad should only contain a few words and perhaps an image. When customers click on the ad, they will be redirected to the desired page. You, as the seller, pay a certain amount for each click. That means you are only spending money when people actually click on the ad, so you at least know you are getting eyes on your page. You determine what the campaign budget is going to be. The minimum amount is $100. You are then provided with tools to determine how many people who clicked on the ad ultimately purchased something. That way you can adjust the ads in the future. Amazon Marketing Services offers a basic run-down of how Headline Search Ads are supposed to be utilized. Once you understand how to fully optimize these marketing services, you can expect to see some substantial results. Obtaining Headline Search Ads for your business is simple enough. For a step-by-step guide, you can watch this informative video, provided by Amazon Marketing Services. After you have selected Headline Search Ad from the available options, you decide whether you want to advertise a group of similar products, a custom URL or a page devoted to your bestselling products. You then decide the campaign name. Remember to pick something memorable and filled with keywords. You then decide what the budget is going to be. While the lowest amount you can opt for is $100, you can select a higher amount if you want. Additionally, you are not going to be charged for the entirety of the budget up front. Instead, you are charged in increments throughout the campaign as people click on the ad. Next, you decide how long the campaign is going to run. If it is your first campaign, then you should stick to one month at first to see how well it goes. After that, you get into the keywords you want. Amazon recommends picking between 30 and 40 keywords. The keywords you select should be relevant to the items you are going to sell. Finally, you should select the headline you want. Again, this needs to be relevant to what you are selling. You also need to choose an image. One may already be provided, but you can upload your own. You then submit your ad for approval. You can expect to hear back within 24 to 72 hours. You are notified by email if your ad has been approved. Which Keywords Are Beneficial To Include? The right keywords to use come down to what you want to sell and what people are likely to search for on Amazon. Typically, you want each keyword to be one or two words in length. Once you have done a few test runs of your ad campaign, you can optimize keywords further to make them more specific. One of the keywords should be your brand name and the name of the product. For instance, if a company was going to sell a food processor, then one keyword could be “KitchenFriend Food Processor.” Some of the keywords can also be the names of competitive brands in your particular industry. Finally, you can have keywords about the activities the product could be used for. Since food processors are generally used in the kitchen, you could have some keywords be along the lines of “pureeing” and “grating cheeses.” A mix of all these different types of keywords is recommended for optimal results. What Are Some Additional Tips for Enhancing Headline Search Ads? Many small businesses are not going to be able to compete for popular keywords. One part of the initial process is determining how much you want to bid for each click. The lowest you can go for a bid is $0.50, but if you are aiming for high-traffic keywords, then $0.50 is not going to be enough. You can go higher, but it all depends on what other bids Amazon has received. To increase your chances of getting clicks, it may work in your best interest to find keywords that are not searched for as often but still manage to get searches. At the end of the day, it does not matter how many people see your ad. It matters how many of those clicks you can turn into purchases. There are so many opportunities that it can be difficult to figure out which ones are worth investing in and which ones should be ignored. Luckily, Headline Search Ads on Amazon fall into the former category. If you are setting up your first campaign, then you want to run a few tests first. In fact, you can run several tests simultaneously. You can change key factors in both of them, and at the end of the trial run, see which one performed better. You can make alterations as needed, and after a month or two, you will have a viable campaign. If your business is already selling items on Amazon, then this is another tool at your disposal to utilize. 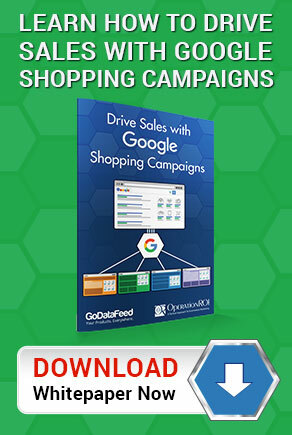 If you’re selling your products on Amazon and not hitting target goals with your paid search campaigns, then we can help. To learn more about how OperationROI helps our clients sell more on Amazon, contact us at 1-888-277-5429, or by filling out our contact form. Increase Amazon Sales! Contact Us Today! Hi, do you know if it is possible to run Headline Search Ads under an AMS account and Seller Account for the same ASIN at the same time? Does this compete for the same ad space, or does Amazon realize the accounts are connected? Since Headline Search Ads are relatively new to Seller Central I cannot answer that with any certainty. However, based on past experience with Amazon, I do not believe that Amazon will associate the accounts and you will be fighting for the same ad space.